It is always fun to see how various brands dress their space. It is this space, after all, which represents and showcases the personality of the brand. 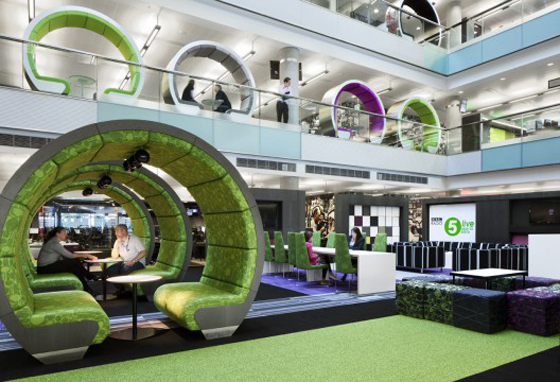 Working with ID:SR, BBC North created a unique and empowering environment within their new design hub in Great Manchester, England. The idea for the space was to create an environment that would work more effectively and creatively in less, more efficient space. This lead to an “amenity-centric” mentality. What this means is the workplace supports agile working across a variety of desirable work settings tailored to a range of activities, whether holding a team meeting, making a phone call, editing content, having an informal catch up, tweeting or blogging. It even doubles as a studio space, providing the backdrop to a variety of broadcasts. One area showcasing this idea is located along an area of dead space at the edge of the atrium, which was too narrow for desks or rooms. Visually striking pods were incorporated. These areas add another opportunity for interaction and collaboration. And the inspiration? Digital pixels! 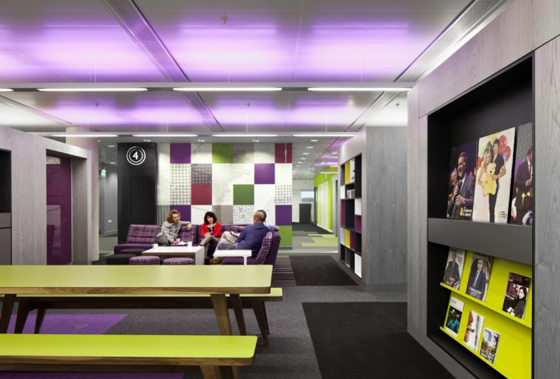 What is intriguing about the space is the amount of color, visual interest and continuity. The focus of form and color within the environment creates a welcoming and comfortable space. Everything flows, from the furniture, to the walls, to the lighting. On top of color, there is pattern and texture. When looking at creating environments that are so visually stunning, there is an opportunity for incorporating various materials. This can include applying fabric with graphics to the walls, instead of wall paper. Anything from inner office walls to light fixtures can be created with fabric. An additional connection point can be created by incorporating texture. Another benefit? Fabric can easily be swapped out as the messaging or mood changes.